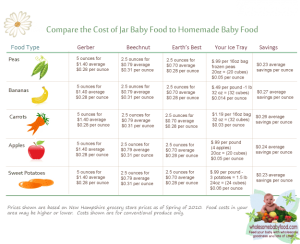 The cost benefits are just another bonus of making your own homemade baby foods that add to the nutritional benefits. This is specifically true as baby moves to “Stage 2-3, or Toddler Meals” commercial foods. Stage 1 foods, and Stage 2 single ingredient foods, seldom have fillers however the advanced mixes and dinners/meals baby foods may contain starchy fillers and other ingredients that are not of any nutritional value. We have prepared a crude chart, without fancy statistics or graphs, to give you an idea of what the monetary cost savings may be. The prices for the jarred food are for Stage 1, single ingredient foods. The prices for the produce below are reflective of the Southern New England – USA market; non-Organic produce. Prices vary and your savings may vary from a just a few pennies to $.10 or more. Remember that the cost savings is an additional benefit; beginning good healthy eating habits early and knowing exactly what is going into your baby’s tummy is really priceless.